Dakgalbi is a delicious, spicy grilled chicken dish that’s a popular choice for friends who are getting together to go out to eat. It’s a natively communal dish that’s always shared among a small, intimate group of people, so it naturally stimulates conversation and a good time. It’s pretty much impossible to eat dakgalbi in silence! When you’re almost completely finished, you can ask the waitress: “We’d like some stir-fried rice please.” She’ll bring out some rice, mix it with the leavings in the skillet, and quickly fry up some spicy, stir fried rice. She might divide the rice into portions and serve it to everyone at the table, or she might just leave it in the pan and let everyone dig in. For many people I know, this is their favorite part! 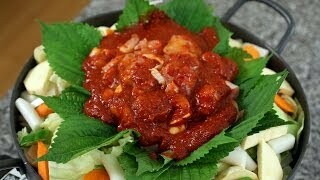 Don’t have a dakgalbi restaurant near you? Now you can make it at home! Invite your family and friends over, and prepare all the ingredients. “Are you guys ready to eat dakgalbi?” you can ask. Bring out the pan filled with lots of vegetables, chicken, and the sauce, and cook it at the table. Your house will be full of an irresistible, delicious aroma, laughter, and conversation, I guarantee! Enjoy the recipe! Let me know your dakgalbi stories: how you prepared it, how you modified the recipe, how many guests came over, and how much they loved loved loved it : ). I’m really interested in your stories, so tell me in the comments or upload a photo and tell me there. Cut the chicken into bite size pieces and put them into a bowl. Mix with 1 tablespoon soy sauce and ground black pepper by hand or a spoon. Set aside. Prepare the sauce by combining garlic, ginger, hot pepper paste, hot pepper flakes, 2 tablespoons of soy sauce, and cooking wine in a bowl. Mix it well with a spoon. If you use a food processor, blend it until creamy for about 1 minute. Prepare a large, shallow, and wide pan or a grill for the dakgalbi. Spread the cabbage on the bottom of the pan. Add the onion, green chili pepper, carrot, rice cake, and sweet potato. Add the perilla leaves on top. You can cut them a few times or place the leaves whole. The leaves will shrink when cooked, so don’t be afraid to be generous! Put the marinated chicken in the center of the pan, on top of the vegetables. Put the sauce on top. Cover and cook over medium high heat for 2 to 3 minutes. Stir with a wooden spoon so the pan doesn’t burn and the ingredients and sauce mix evenly. Lower the heat to medium and cover. Cook for another 20 minutes, or until it’s done. Keep stirring with a wooden spoon. Now you can eat. The cabbage will cook first, followed by the rice cake, chicken, and sweet potato, so eat in that order. Keep the heat low during the meal. Cook, stir, eat, and talk. The pieces will be hot, so be careful! If the dakgalbi becomes totally cooked, turn off the heat. When it’s almost totally finished, add some rice and chopped kimchi to what’s left on the grill and stir with a wooden spoon over medium heat for a few minutes. Serve in separate bowls, or give everyone a spoon and let them eat from the pan together. Posted on Friday, November 15th, 2013 at 11:20 am. Last updated on October 6, 2014. Posted March 28th, 2019 at 11:18 pm | Log in to reply. Hi Maangchi! I love your videos and I even watch them when I’m doing intermittent fasting for my diet. I really want to make dakgalbi and I’m wondering if I have to soak my frozen rice cakes in hot water first before adding to the pan with vegetables and chicken. Or do I just thaw the frozen rice cakes in the refrigerator and add to the pan? Posted November 16th, 2018 at 9:44 am | Log in to reply. How many pax does this serve? Posted June 14th, 2018 at 1:54 pm | Log in to reply. Made Dakgalbi for the second time today. This time I had garaetteok and perilla leaves available, only left out the sweet potato, as combined with rice it contains carbohydrates more than enough. Substituted the green chillies with green bell pepper, as the local chillies are hotter than the korean ones, and with the gochujang it´s spicy enough for me. For marinating the chicken (breast this time), I added a little salt, minced garlic, some white wine, and a couple of drops of sesame oil to the soy sauce, then pan fried it before adding to the veggies: the result was very tasty, I can only recommend this. Posted June 19th, 2018 at 8:50 am | Log in to reply. Posted June 21st, 2018 at 9:10 pm | Log in to reply. Kam sa ham ni da! Yes, I´m improving, and the main ingredients I can get in the korean groceries in Quito. My preferred store is Seoul Market, which I submitted to you myself. Only thing which seems impossible to get is korean pear: wanted to make Bulgogi. Posted July 4th, 2018 at 4:41 am | Log in to reply. Can you find any other types of pears? I have made bulgogi with other pears before, and the end result isn’t really that different :). You can even try using apples – I would stick to a sweet, less-tart variety though. Hope this helps! Posted May 8th, 2018 at 4:55 pm | Log in to reply. Just a note – video show 1 teaspoon of kosher salt in the sauce but the printed recipe leaves that out. The salt is needed. This recipe was originally posted on November 15, 2013 at 11:20 am by Maangchi. It was last updated on October 6, 2014. The video was watched 802,782 times on YouTube & has 10,388 likes!